The bridge needed some TLC. Standing on the old bridge, Graham Seiler dreams of the possibilities. 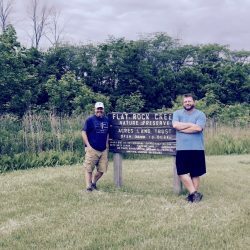 Graham Seiler took the path less traveled. 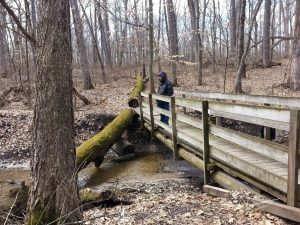 Given options for volunteer work toward earning Eagle Scout status, Seiler chose to replace a slippery, weathered bridge at Bicentennial Woods near Huntertown, Indiana. Wanting something that would last—that his grandchildren might see—Graham, now a senior at Eastside Junior-Senior High School in Butler, chose steel rather than simply re-using some of the older bridge’s wood. 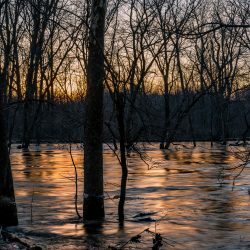 Eagle Scout projects require scouts to demonstrate the leadership skills they have developed over many years of scouting, including securing their own resources. ACRES’ bridge project proved worthy. After selecting structural materials, Seiler headed to Vulcraft to secure his first major corporate donation. This St. Joe steel company not only supplied joists and all steel materials, but also connected employee Kendall Clyde, an Eagle Scout, with Seiler to revise his design. The two opted to make the bridge’s trusses double as handrails and settled on concrete decking for endurance and traction. A troop member then introduced Seiler to Chris Harmon of Hagerman Construction Corporation who provided tools and a crew for concrete work, demonstrating the process to the troop before and during the process. Harmon also brought in Cris Mabbitt of Irving Materials Inc (IMI). Upon review, Seiler’s father, an engineer, advised against pouring concrete and suggested two-ton concrete blocks as an alternative. New challenges emerged: during the project, Seiler would adjust the concrete block size (at one point using a tape measure to ensure the blocks could be delivered to the site), and he’d need heavy equipment to deliver the blocks. Steel proved a similar challenge: how to move 700-pound trusses to the site from a parking lot and down a trail without eroding soils or damaging trees? Seiler’s staff liaison, ACRES land management specialist Evan Hill, suggested an access route straight from the road. Road access and parking on a blind curve on a busy road provided additional challenges. More partners jumped in: Southeastern Equipment Rental Co. provided an excavator small enough to maneuver between trees in order to dig the holes for the concrete blocks. Seiler Excavating, owned by Graham’s uncle, lent an excavator for removing the old bridge, and hauling in the steel frame and blocks. Three Rivers Barricade offered safety signage for the blind curve on Shoaff Road. After several rainy days delayed the big installation work, Seiler’s vision began taking shape in the preserve. Heavy equipment carried in significant structural pieces for the new bridge and hauled out the sagging former bridge. With the bridge structure in place, a volunteer crew from Hagerman, 10 troop members and a handful of parents helped pour and finish the concrete decking. When Hagerman suggested stone as an erosion-prevention transition to the bridge, Hanson Aggregates came through with enough stone for this, plus a bit left over to repair the parking lot. They connected Seiler with Bailey Trucking who donated stone delivery. With his family pitching in as they had all year, Seiler helped with finishing touches: installing the stone, and painting with Sherwin Williams-supplied paint. Home Depot on Lima Road gave tools for various uses. Seiler added a sign thanking his supporters. As the project neared completion, Seiler planned a celebratory ice cream social. As you can guess, he handled all the details. After graduation, Graham Seiler plans to pursue study in math or science. View the transformation process of theBicentennial Woods bridge in the photo gallery below. 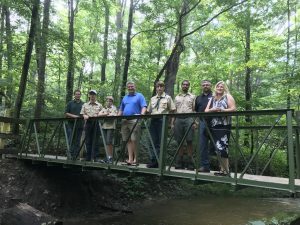 ACRES hopes you plan to trek the bridge he built, connecting community to the woods you help protect. Three cheers for Graham, the Seiler family, the myriad corporate donors and you, ACRES members.